Who invented Plastic? The name of the person credited with inventing Plastic known as Bakelite is Leo Hendrik Baekeland (1863 - 1944). Leo Hendrik Baekeland is not only famous as the Belgian-born American inventor of Plastic but also as a chemist and businessman. When was Bakelite Plastic invented? Leo Baekeland invented Bakelite, the first fully synthetic plastic in 1907, during the Second US Industrial Revolution period of invention (1850 - 1914). The invention of Bakelite Plastic originated in America and is considered a highly influential achievement in the field of packaging and electronic equipment covering. Definition of Plastic: Plastic is defined as a generic name for certain a substance made of synthetic or semi-synthetic materials that have a polymeric structure. Plastic is soft or liquid when heated and can be molded then pressed into thin layers on objects. Plastics can be colored or shaped and have many combinations of the properties including hardness, elasticity, durability and resistance to heat and cold. What is the use of Plastic? Plastic is used to make many inexpensive items such as microwavable packaging, carbonated drinks bottles, peanut butter jars, microwavable packaging, supermarket bags, small household items, cutlery, toys and molded plastic cases. Plastic polymers: Plastic polymers can be derived from plants and also conventional feedstocks. Feedstock is a raw material such as oil or natural gas that is used to supply, or fuel, a machine or industrial process. Fact 1: Who invented Plastic? The Plastic known as Bakelite was invented by Leo Baekeland in 1907 during the Second US Industrial Revolution era of inventions (1850 - 1914). Fact 2: Who invented Plastic? Prior to the invention of Bakelite Plastic in 1907, the only materials that could be molded were glass and clay (pottery). In 1862 the first man-made plastic, nitrocellulose (called Parkesine), was invented by Alexander Parkes (29 December 1813 – 29 June 1890) from cellulose treated with nitric acid and a solvent. Fact 3: Who invented Plastic? In 1868, an American inventor called John Wesley Hyatt (November 28, 1837 – May 10, 1920) developed the first industrial plastic he named Celluloid. Celluloid was made by plasticizing the nitrocellulose with camphor and was used as a photographic film. Fact 4: Who invented Plastic? The invention of Bakelite Plastic followed the invention of the first plastics known as Parkesine and Celluloid. The inventor of Bakelite Plastic, Leo Hendrik Baekeland, was born on November 14, 1863 in Sint-Martens-Latem, Belgium and died on February 23, 1944. Fact 5: Who invented Plastic? The early years of Leo Baekeland were spent in Saint-Martens-Latem, Belgium where he was raised by his family. 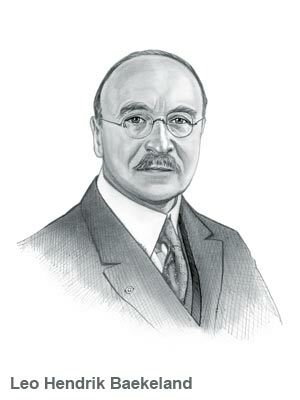 Leo Baekeland was educated at Ghent University where he gained a bachelor of science degree. Fact 6: Who invented Plastic? Following his education his first job was as an assistant professor at the University of Ghent where he stayed for several years. During this time he married Celine Swarts on August 8, 1889 and the couple had three children called George, Nina, and Jenny. Fact 7: Who invented Plastic? Leo Baekeland and his young family went to the United States on a traveling scholarship. Whilst he was in America he was offered a job at the E. and H.T. Anthony photographic company, and decided to settle in America and make it his home. Fact 9: Who invented Plastic? At this time Leo Baekeland was well aware of the work conducted by American inventor John W. Hyatt who, in 1872, had manufactured celluloid. Celluoid was a thermoplastic substance that consisted of a mixture of cellulose nitrate, camphor, and alcohol, that was used to make cinematographic film. Fact 10: Who invented Plastic? In 1891 Leo Baekeland left the Anthony company to establish himself as a consulting chemist and in 1993 established the Nepera Chemical Company to manufacture Velox paper. Fact 11: Who invented Plastic? Leo Baekeland sold his company to Eastman Kodak and invested the money in his own private industrial research laboratory in Yonkers, New York. Fact 12: Who invented Plastic? Leo Baekeland began experiments in electrochemistry and was granted patents for his work with electrolytic cells. Fact 13: Who invented Plastic? Confident in his own abilities Leo Baekeland then began searching for a fully synthetic substitute for the resin shellac which was used in varnishes, paints and inks. Fact 14: Who invented Plastic? At the time shellac was an entirely natural product Leo Baekeland realized that the market was ready for a cheaper, artificial substitute. Leo Baekeland focussed his research on finding a solvent that would dissolve a sticky, resinous substance formed by a condensation reaction of formaldehyde with phenol. He believed that a solvent capable of breaking down this sticky, resinous substance would possess the shellac-like properties he was looking for. Fact 15: Who invented Plastic? His experiments failed as he was unable to create an appropriate solvent. Leo Baekeland failed to synthesize shellac but his experiments led to the invention of Bakelite, the first successful plastic. Fact 16: Who invented Plastic? The invention of Plastic began when Leo Baekeland began to investigate the reactions created by different combinations of phenol (aka carbolic acid) and formaldehyde, highly water-soluble gas. Fact 17: Who invented Plastic? Leo Baekeland developed thermoplastic, which could be repeatedly softened and re-molded by heat and pressure, giving the material "plasticity". Fact 18: Who invented Plastic? Leo Baekeland's plastic was a clear solid that was water, heat and solvent resistant and nonconductive. Leo Baekeland patented the solid plastic in 1907 and called it Bakelite. Fact 19: Who invented Plastic? Bakelite was the first totally synthetic plastic and the first thermoset plastic. Bakelite was a dark, nonflammable, brittle plastic that could be used to create different composition and shapes and a great material for use in electrical uses as well as appliances and had the added advantage of the ability to be made in many colors. Fact 20: Who invented Plastic? Bakelite was a massive success. It was cheap, versatile and came in a variety of colors. Bakelite is a nonflammable material that was cheaper and more versatile than other known plastics. It was used in the booming automobile, radio and telephone industries, a range of household appliances and even jewelry. Fact 21: Leo Baekeland died in Beacon, New York, at the age of eighty, on February 23, 1944. Fact 22 - Impact: How did Plastic impact the world? The impact of the invention of Plastic was a paramount step to improving the field of Textiles and packaging. Who invented Plastic? Now you know that Leo Hendrik Baekeland was the person who invented Plastic! We hope that the facts in this article have provided the answers to all of your questions about the invention of Plastic and its famous inventor, Leo Hendrik Baekeland who founded the modern plastics industry through his invention of Bakelite. History of Plastic? The history of plastic continued with the invention of Polyvinyl chloride, or PVC in 1920, Plexiglas in 1931, Teflon which was invented by Roy Plunkett in 1938, Nylon in 1939, Lexan in 1953, Styrofoam in 1954 and in 1965 Stephanie Kwolek develop the plastic compound Kevlar.